As most regular readers will know, Screenqueens is always on the look out to showcase films, but February is a little special. Its Women in Horror Month! Women in Horror Month aims to showcase and carve out a space for women in the horror genre, whether this be behind the scenes, writing directing and producing, or on-screen badass-ery. A true celebration of everything, bloody, creepy and downright brilliant. So this month we would LOVE to see a few horror shorts (features are cool too!) coming our way, whether you’re an amateur having a laugh with some mates or passionate about becoming a genre film-maker, ANYTHING GOES. 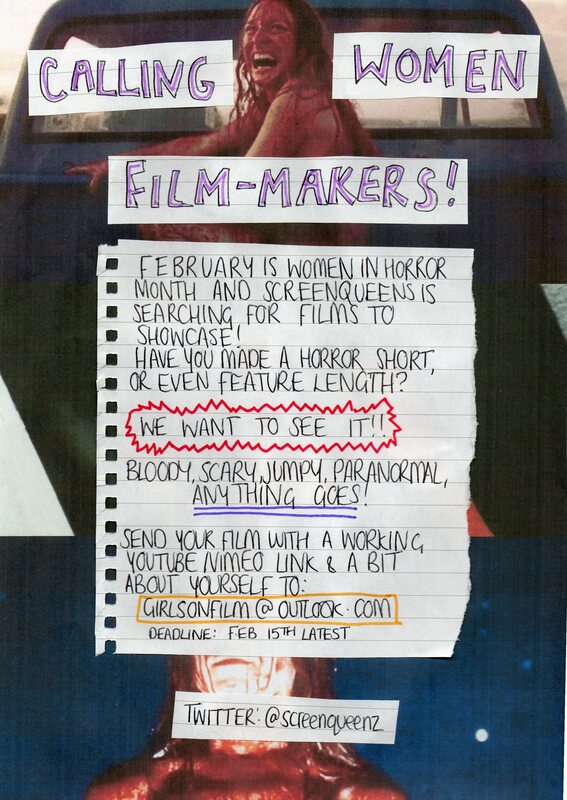 So search out that Youtube video where your friends covered in fake blood (tomato sauce) and you terrified the neighbours by pretending you were zombies, and get it submitted to girlsonfilm@outlook.com by FEBRUARY 15TH AT THE LATEST. This is awesome! We would love to add this to the official Women in Horror Month website. Can you submit it here: http://www.womeninhorrormonth.com/get-involved/submit-an-eventproject/ and we can share it on social media as well. LOVE the poster!